The fast growing number of hybrid and electric cars will require comprehensive electricity supply within a few years. For this reason, EnergyParking is of modular design according to the master-satellite principle. A master controls several satellites per RDT that are configured in groups of two, three or four. 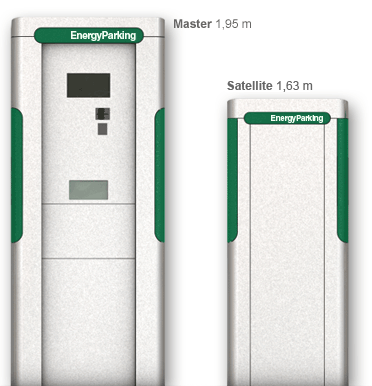 This ensures that the operator is able to scale up his system in response to demand at minimal incremental cost: EnergyParking keeps pace with requirements. While the satellites alone are responsible for charging vehicles, it is possible to select and pay at the master – and depending on the configuration– procure energy as well. The charging stations were designed by the well-known Institute for Innovation Transfer of the University of Hannover. The design is ergonomically sophisticated and attractive. Master and satellites are exceedingly robust. Their housing is made of stainless steel and the charger socket covers are lockable. The TFT screen of the master is protected by safety glass. As a result, all EnergyParking modules are protected against theft and vandalism. The operator decides on the final look of the pay and display parking meters. The meters can have any corporate messages or logos at minimal expenditure, and can also display your own or third-party advertising.